Realising the potential of digital trade across Australia and the South East Asia region is the focus of a Recommendations Report released today by Standards Australia. The report is part of the ASEAN – Australia Digital Trade Standards Cooperation Initiative. The ten key recommendations in the report focus on utilising International Standards as a means to increase economic integration and digital trade in the ASEAN-Australia region. The recommendations were developed and endorsed by stakeholders from the public and private sectors of ASEAN and Australia, in a two-day Workshop held in October 2018. Collectively, these recommendations will address the complex issues and barriers to digital trade which were identified by stakeholders across the region. “Through close collaboration with ASEAN, there is now a much better understanding of the challenges in the region and how standards can help provide a solution,” said Dr Bronwyn Evans, CEO of Standards Australia. 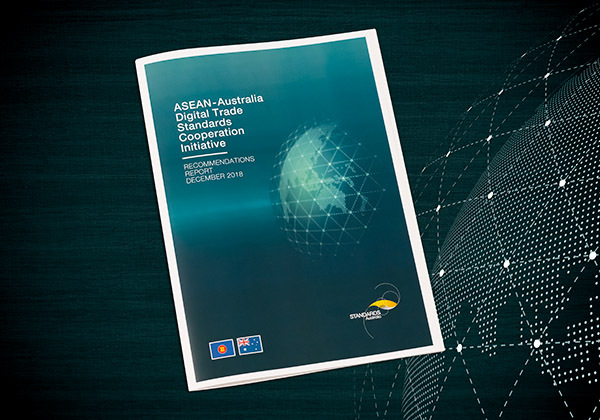 The Recommendations Report has been presented to the Australian Government and the Governments of ASEAN nations, for their consideration in progressing a second phase of the ASEAN-Australia Digital Trade Standards Cooperation Initiative.